Much better CSC than OEM for VQ Engine! Perfect, i love this clutch feels great. Please note that all of our products are Built/Modified in the US. Our genuine 4140 Chromoly flywheel was designed to give drivers a snappier throttle response and quicker shifting. Our lightweight flywheel causes the engine to rev faster which means quick take offs all day long. This Flywheel balances out your engine by reducing the rotating mass/weight. Has chromium and molybdenum added into the steel to give added strength and durability. The core of the material retains its bulk properties, while the outer surface is significantly hardened to reduce wear and tear. This makes this grade of steel an excellent material for a flywheel. Unlike Aluminum Flywheels, ring gears will not separate and friction surface wont warp. This Flywheel can be resurfaced for future clutch service. It has been proven and tested up to 18,000RPM's without any type of failure. Engineered and Designed to increase airflow to help cooling in most lightened flywheels that we carry. High Heat capacity mixed with low weight gives you an appealing shifting experience. 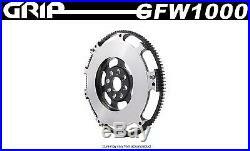 GRIP Chromoly Flywheel can be used with ANY brand name clutch from OEM/Stock Clutch to ANY Aftermarket Clutch. Proven and Tested up to 18,000RPM's without failure. Increase airflow to help cooling. Only 9LBS Recommended/Good For: Any Type of racing or normal driving on/off TRACK or STREET. This is a Brand New GRIP Clutch U. A Genuine 9LBS Chromoly Flywheel. 4140 Genuine Chromoly 9LBS Lightened Flywheel. The Advantage of using our products is that we do not import from China or Korea. We not only value our customers but we also value their needs and demand for a quality car part. We have come to accomplish three goals. The first goal is to provide car enthusiast with an important car part that will not break and will perform fantastic when using on and off the Track/Street. Our Second goal was to provide car enthusiast with a critical car component at high quality and at an AFFORDABLE price. Most importantly, We believe that every car enthusiast should be able to experience some performance level in their car application at the right, affordable price. Quality and Affordability are our Key factors and beliefs within our company. All Materials are checked for strength and durability. Must be in original packaging and brand new. Items that have been used, installed, damaged, or altered are non-returnable. Any damaged merchandise received must file a claim with the carrier and not with GRIP Clutch. All PUCK CLUTCH DISC(S) need at least 500 miles for break-in. All KEVLAR DISC(S) need at least 1000 miles for break-in. All FULL FACE ORGANIC DISC(S) need at least 200 miles for break-in. The item "GRIP CLUTCH 10LBS Flywheel 1990-2005 Honda Civic All Model with SOHC Engine" is in sale since Friday, October 02, 2015. This item is in the category "eBay Motors\Parts & Accessories\Car & Truck Parts\Transmission & Drivetrain\Clutches & Parts". The seller is "advancedclutchsolution" and is located in Los Angeles, California. This item can be shipped worldwide.